OKAY I AM GOING TO DO MY BEST TO KEEP THIS AS SPOILER-FREE AS POSSIBLE, OR AT LEAST NO MORE SPOILERY THAN ANY OF THE TRAILERS, BUT NONETHELESS, CONSIDER YOURSELF WARNED. In Chris Nolan’s The Dark Knight we last saw Batman being pursued by the Gotham City Police after taking the blame for Harvey “Two Face” Dent’s murderous rampage and death. 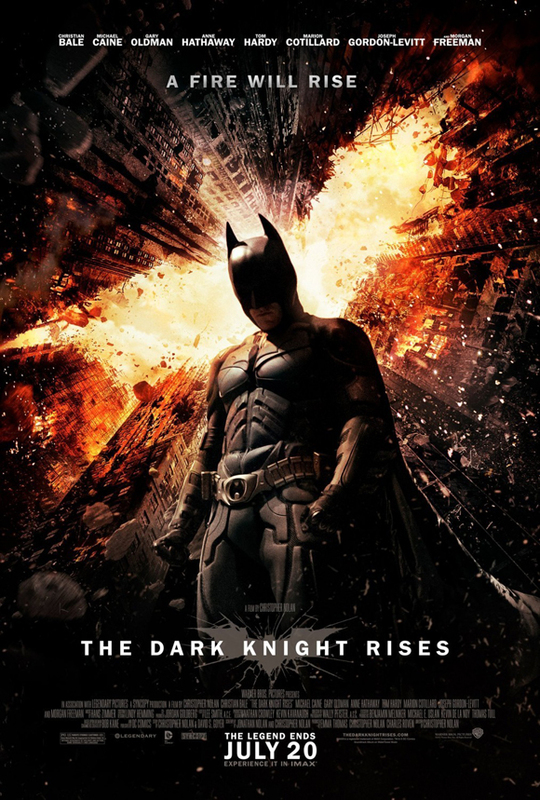 It was an very dark place to leave our hero, but now, four years later Nolan and his team return to conclude his tale of the Dark Knight legend in The Dark Knight Rises. The movie picks up eight years later, Harvey Dent’s death galvanized the politicians to initiate legislation that keeps the criminals off the streets. Gotham City is more or less at peace. But it’s a peace built on a lie, and that lie is a burden that weighs heavily on Commissioner Jim Gordon (Gary Oldman). Batman (Christian Bale) has not been seen since that fateful night leaving Bruce Wayne a recluse, wasting away in the east wing of Wayne Manor mourning the loss of Rachel Dawes and almost more importantly, his purpose in life, being Batman. When a terrorist known only as Bane (Tom Hardy) threatens Gotham, Bruce is forced to don the cape and cowl one more time to save the city he has been fighting for most of his life. He must turn to old allies like Alfred (Michael Caine) and Lucius Fox (Morgan Freeman), and a few new ones like Cat Burglar Selina Kyle (Anne Hathaway), Officer John Blake (Joseph Gordon Levitt) and Wayne Enterprises Board Member Miranda Tate (Marion Cotillard). I had been looking forward to this film since the first time I saw the credits roll for The Dark Knight back in 2008. I consider the Nolan Batman films my favorite films ever (with the possible topper being Raiders of the Lost Ark) . If you follow my column, The Impact you know I never hesitated to include a story about the film. But expectations were so high even I was nervous about Nolan delivering an amazing conclusion. I knew it was going to be good, but would it be in the same ballpark as the previous two films? So this past Friday as I sat in my local movie theater I waited with bated breath to see if Nolan could break the trilogy curse and stick the landing. So did it deliver??? The very short non-spoiler answer is, ABSOLUTELY!!!! I won’t lie, as the credits rolled I wiped a few tears from my eyes. If you take away the capes, masks, and action and you are left with a brilliant story of a broken man trying to save his city.The trilogy is flawlessly executed. It’s two hour forty-seven minute run time moves briskly. I shouldn’t be surprised Nolan and his editor Lee Smith fit a lot into this movie but it never felt like it was dragging, which is quite the accomplishment. Christian Bale delivers his best performance to date. This is a very damaged Bruce Wayne whose mind and body are broken, even when you see his mind is willing the body is weak. Throughout the first two acts of the film Bruce just looks exhausted. And if you think Bruce hit rock bottom at the end of The Dark Knight you would be wrong Nolan and Bane don’t just break him, they want to grind him down to dust. So that when he finally returns it is that much more of an amazing reveal of character. In Rises there is subtly and nuance we have not seen in his previous performances as the character and this maybe my favorite interpretation of Batman. It’s a well written, amazingly performed distillation of the character. Gary Oldman is practically his on adjective when it comes to acting. His Jim Gordon is one that is burdened by success that came with too high a price. He, like Bruce is just corroding from the inside. Publicly and privately paying for what he did to save Gotham. Michael Caine is phenomenal as Alfred Pennyworth. Every scene between him and Christian Bale is incredibly emotional and for the most part heart-breaking. He is the parent who sees his child in perpetual pain and it just tears him up inside. Even with limited screen time his presence is never not felt. Tom Hardy had a very tough role to play. Bane is evil. His conviction and power, pure and unwavering, it is not a role made for a lot of nuance but it is one that Hardy excels at. With most of his face covered he relies mostly on his eyes and body movement. It’s an incredibly confident performance . When he fights Batman; both Bane and you believe that Bane can kill Batman. Joseph Gordon Levitt’s character of John Blake is an original character to this Batman universe who plays a familiar role. He is the everyman helping to guide us through the world and it’s events. His arc is logical and surprisingly satisfying. And last but not least Anne Hathaway’s performance as Selena Kyle is fantastic. She is as engaging and alluring as you imagine the character of Selina Kyle would and should be. She could easily carry her own film is the situation would call upon it. Satisfying…That’s the word that I keep coming back to when I think about the movie. The film alone does have some faults but when you look at it as the conclusion to a trilogy it is phenomenal and a completely satisfying end. Some comic fans will be upset over the ending. To that I say take a step back and look at it in the context of the world Chris Nolan establishes in Batman Begins, The Dark Knight and this film. It works incredibly well and you feel like your faith has been rewarded. People need dramatic examples to shake them out of apathy and I can’t do that as Bruce Wayne, as a man I’m flesh and blood I can be ignored I can be destroyed but as a symbol, as a symbol I can be incorruptible, I can be everlasting. This becomes the thesis statement of the entire trilogy. Bruce’s mission to create a legend to inspire the citizens of Gotham to save their own city. And Rises delivers on that statement in spades. I can not recommend enough that you watch both Batman Begins and Dark Knight before you see Dark Knight Rises. I promise it will make your screening much more fulfilling. I also want to take a moment to recognize Han Zimmer for his amazing score, it’s bombastic percussion, chanting and strings gave the films an rich and complex pulse. His score in Dark Knight Rises is definitely a more visceral and emotional score. Many will argue that Rises is not as good as The Dark Knight and I can’t really argue with them. Batman Begins and Dark Knight work better as stand alone films. Rises has some faults in terms of logic and time leaps but the emotional satisfaction allow you to forgive and suspend your disbelief. Having only seen it once I can tell you I am desperate to see it again, like the previous two films, this is a very rich and layered film. This is a film worthy of multiple viewing because there is something you can get out of it each time.This is the most epic film of the trilogy and I was completely okay with seeing Nolan go for broke and push beyond his normally very grounded world into more of a comic book world. When you look at this trilogy as a whole it succeeds in so many ways. I personally do not want to see Nolan or any of his team return to the character and this world. The legend is told and like all great stories their significance can only truly be known and appreciated once it is over. So now I simply say a very humble thank you to Chris Nolan, Christian Bale, Michael Caine, Gary Oldman, Morgan Freeman and all the actors and filmmakers involved in making this masterpiece of a trilogy.